Howling vortexes. Drowned cities. Giant writhing creatures and stunning steampunk scenes. 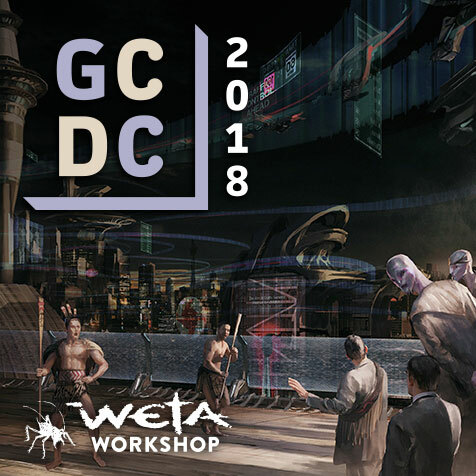 Each year, Weta Workshop calls for New Zealand tertiary students to turn their imaginations into stellar pieces of art for the Gwangmyeong Concept Design Competition (GCDC). In store for the winner and first runner-up: a creatively inspiring trip to South Korea with Weta Workshop CEO and co-founder, Richard Taylor. The competition is open to all New Zealand students of any age and any discipline and is the result of a rewarding partnership between Weta Workshop and Mayor Yang Ki-dae of Gwangmyeong City in South Korea. The Korean branch of the contest will run concurrently to the GCDC. To enter, students are asked to submit artwork based on a creative brief devised by Richard and this year he wants to see something he’s never seen before. ‘We’re asking students to imagine that a famous international television producer is making a new series based around a fantastical land on an unknown planet, not unlike our own planet – think Earth in the Late Middle Ages. What might this alien world look like, at that point in time?’ he says. This year, it’s all about combining fantasy, reality, history, and imagination in a stunning piece of artwork. There is no limit to the number of pieces students can submit. The judging panel will consist of Richard Taylor and key members of the Weta Workshop Design Studio. The designers, whose recent work includes Pacific Rim Uprising, A Wrinkle in Time, Blade Runner 2049, and the Netflix series Altered Carbon, will be looking for originality, technical ability, and believability. It’s a fantastic opportunity for entrants to get their work in front of the eyes of industry. Some, like 2015 runner-up Tahiwi Trenor Hunt (Massey University), 2017 runner-up LiWen Choy (Auckland University), and Korean winner Yoojin Seong, have gone on to secure employment at Weta Workshop. It’s not just a week in South Korea to look forward to. Wacom, whose high-tech graphics tablets are a staple of the Weta Workshop Design Studio, will once again donate prizes for the three top artworks: for the winner, a Cintiq Pro 13 creative pen display, valued at NZ $1599; and for the second and third place-getters, an Intuos Pro Medium valued at NZD $579.